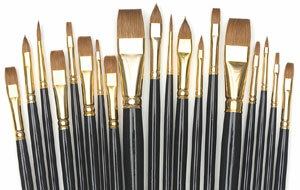 One of America's foremost portrait painters offers two sets of oil portrait painting brushes. Manufactured especially for John Howard Sanden by Silver Brush Ltd. Each brush has the finest hog bristles, nickel plated ferrules, and smooth finished handles. This is a slightly larger set of Pure Red Sable Renaissance brushes. 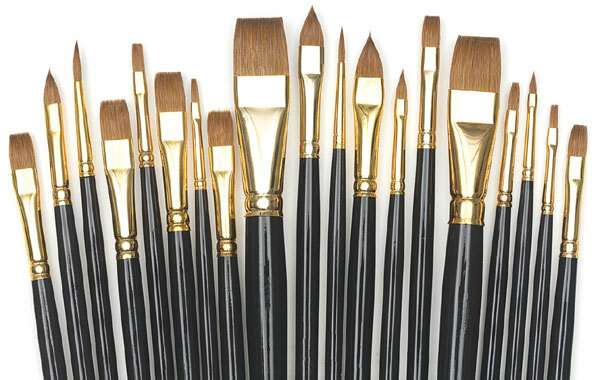 The set includes two Series 7100 Round brushes in sizes 6 and 8. There are five Series 7110 Cat's Tongue brushes in sizes 2, 4, 6, 8, and 10. Additionally, there are 12 Series 7102 Bright brushes, including two each of sizes 2, 4, 6, 8, and 10, and one each of sizes 18 and 20. ™ John Howard Sanden is a trademark.